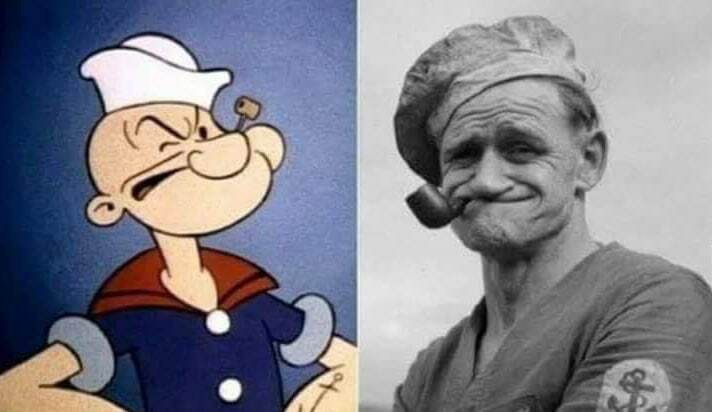 Popeye the Sailor is a cartoon fictional character created by Elzie Crisler Segar. The character first appeared in the daily King Features comic strip, Thimble Theatre, on January 17, 1929, and Popeye became the strip’s title in later years; Popeye has also appeared in theatrical and television animated cartoons. 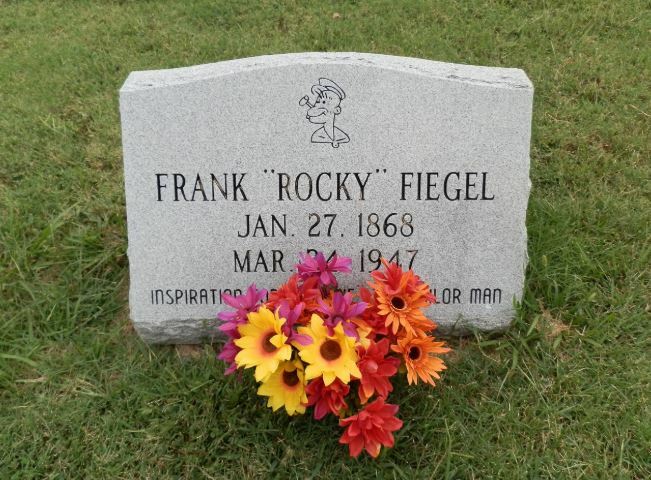 Local folklore in Chester, Illinois, Segar’s hometown, claims that Frank “Rocky” Fiegel (b. January 27, 1868) was the real-life inspiration for the character Popeye. He had a prominent chin, sinewy physique, characteristic pipe, and a propensity and agile skill for fist-fighting. Fiegel died on March 24, 1947 never having married. His gravestone has the image of Popeye engraved on it. The town of Chester erected a statue of Popeye in Fiegel’s honor, which still stands today. According to Popeye historian Michael Brooks, Segar regularly sent money to Fiegel. Separate hometown residents of Chester also are claimed to have served as inspiration for two other Segar characters including Dora Pascal, an uncommonly tall, angular lady who ran a general store in town. She even donned a hair bun close to her neckline. William “Windy Bill” Schuchert, a rather rotund man who owned the local opera house, was the seed for the character J. Wellington Wimpy. He would even send out his employees to purchase hamburgers for him between performances at a local tavern named Wiebusch’s, the same tavern that Fiegal would frequent and engage in fistfights. In 2015, businessman Greg Morena refuted the claim that Popeye originated in Chester, Illinois. Instead, he stated that Santa Monica, California was the birthplace of the character and that a Norwegian sailor by the name of Olaf “cap” Olsen served as the impetus for the character. Research presented in Jim Harris’ 2009 “Santa Monica Pier: A Century of the Last Great Pleasure Pier” raised the idea that while living in Santa Monica, Segar based the physical attributes on Olsen; even though Harris never made a definitive claim.